It’s fun, but often surprising to learn of the things that stick out to them about their younger years. Once I thought about it, I had to admit the pizza-making events at their grandparents’ home were fun — and tasty! Grandma was so good at getting them all involved — all five grandkids. They were each assigned jobs from rolling out the crust to layering on the individual ingredients. They used a cookie sheet and customized each quarter to their preferences. There was never any complaining over pizza or pancakes. They were, for a time, the meals of family harmony and happiness. Thankfully, that short list has grown considerably in the years since. What I should point out is that this pizza wasn’t anything remarkable. It was very good, but it was basic pizza dough, sauce, pepperoni, extra cheese and, for some, mushrooms. When the cousins worked together with a common goal to combine those simple ingredients, the outcome couldn’t have tasted any better, and memories were made without any of us even realizing it. It’s been quite a while since the cousins all congregated around the kitchen island with their grandmother to make pizza. Maybe it’s time to make that happen again. I’m sure the outcome will taste even better than any carryout or dine-in pizzas we’ve replaced the homemade version with in recent years. While I’m not advocating changing the tried and true ingredient list the smaller versions of our kids and their grandmother started with, I did find a host of homemade pizza recipes that use a very wide variety of toppings and even crusts. I’m betting everyone can find one that grabs their attention and maybe even creates some memories along the way. Has anyone noticed how many happy memories include food on some level? Add the flour and salt to a bowl. Make a small well in the middle and add the warm water. Mix together with a spoon for a few seconds, and when the dough starts to come together add the olive oil. Using your hands, bring the dough together, then tip it out onto a lightly floured work surface. Knead for a few seconds to form a ball. The dough should be soft and smooth. Divide the dough into two balls, roll out into large pizza bases and add to baking trays lightly dusted with flour. Add desired toppings and bake in the oven at 400 degrees for 10 to 15 minutes. Recipe courtesy of insidetherustickitchen.com. Pour the crushed tomatoes in a bowl. Add in the seasonings and stir to combine. 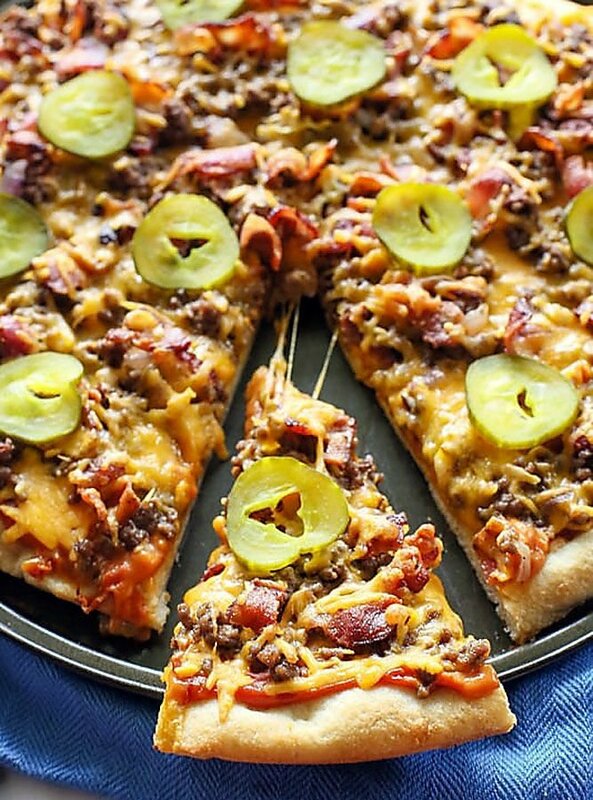 Spread onto homemade pizza and layer on additional toppings as desired. This makes the equivalent of 2 jars of pizza sauce. Freeze leftovers in baggies or in plastic containers. Consider doubling or tripling this recipe to save some for the freezer. Recipe courtesy of eatingonadime.com. Combine butter, heavy cream and cream cheese to a pot over medium heat. Mix and simmer until melted. Stir in parmesan cheese and garlic powder. Simmer on low for 15 to 20 minutes. Spread over pizza dough and add toppings as desired. Recipe courtesy of lilluna.com. Prepare pizza dough through step 5, including preheating the oven to 475 degrees. Cover the shaped dough lightly with plastic wrap and allow it to rest as the oven preheats. To prevent the pizza toppings from making your pizza crust soggy, brush the shaped dough lightly with olive oil. Using fingers, push dents into the surface of the dough to prevent bubbling. Top the dough evenly with pizza sauce, then add the cheese, ham, pineapple and bacon. Bake pizza for 12 to 15 minutes. Remove from the oven and top with fresh basil, if desired. Slice hot pizza and serve immediately. Cover leftover pizza tightly and store in the refrigerator. Recipe courtesy of sallysbakingaddiction.com. In a large mixing bowl or the bowl of a stand mixer fitted with a hook attachment, combine sugar, yeast and warm water. Stir and let sit for 5 minutes or until the yeast is foamy and dissolved. This is called "proofing" the yeast. If the yeast doesn't dissolve, your yeast is dead. Start again with active yeast. Add the olive oil, honey and salt. Mix by hand with a whisk or with the dough hook on low speed for 30 seconds. Add 3 cups of whole wheat flour and mix with the dough hook on low speed or with a large rubber spatula until dough starts to come together. Once mixed, knead for 5 minutes by hand on a lightly floured surface or with dough hook on low-medium speed. If dough is too wet, add up to 1/3 cup more whole wheat flour. After kneading, your dough should be smooth and elastic. Poke it with your finger. If it slowly bounces back, the dough is ready to rise. If not, keep kneading. Shape the dough into a ball and place in a large mixing bowl that has been coated lightly with olive oil. Turn it over to coat all sides. Cover tightly with plastic wrap and allow to rise in a warm environment (about 75 to 80 degrees). Depending on the type of yeast, the dough will have doubled in size in about 1 to 2 hours. (This recipe was tested with Red Star Platinum yeast and it took 1 hour and 20 minutes to double.) Punch the dough down to release the air. It will deflate. Cut the dough into two. Roll each half into a ball and let rest in two separate bowls lightly covered with plastic wrap or aluminum foil for at least 20 minutes. You may freeze one of the dough balls at this point to use at a later time. Preheat oven to 475 degrees. Allow to heat for at least 30 full minutes. Every inch of your oven needs to be very hot. Grease and dust 2 baking sheets or pizza pans with nonstick spray or with olive oil. Sprinkle pan with cornmeal (preferred for flavor and texture) or flour (not preferred). After 20 minutes, flatten each ball of dough, one at a time, on a lightly floured surface or directly onto a cornmeal-lined pizza pan/baking sheet. Flatten into a 12-inch round circle, flattening and stretching the dough. If using a pizza stone, place the dough directly on baker's peels dusted with cornmeal. Lift and pinch the edge of the dough up to create a lip around the edges. To prevent the filling from making your pizza crust soggy, brush the top lightly with olive oil. Using fingers, push dents into the surface of the dough to prevent bubbling. Gently transfer dough to the pizza pan, baking sheet or pizza stone. Top with your favorite toppings. Bake for 15 minutes or until the crust is lightly browned. Slice and serve immediately. Store leftover pizza covered tightly in the refrigerator. Makes 2 pizzas. Recipe courtesy of sallysbakingaddiction.com. Heat a medium skillet over medium heat and fry the pepperoni until crisp. Transfer on a paper towel to drain. Brush each tortilla with a thin layer of pizza sauce (so thin that if you turned it over, none would drip). Sprinkle cheese on top of the sauce on the bottom tortilla. Top with pepperoni and other toppings, if desired. Sprinkle with another layer of cheese and place the other tortilla on top (sauce side in). Preheat a medium cast-iron skillet over medium heat. Lay quesadilla in the pan and cook for 3 to 5 minutes on each side, until cheese is melted and tortillas are crispy. Slice into quarters and serve with a little bowl of pizza dipping sauce. Recipe courtesy of snixykitchen.com. Preheat oven to 400 degrees and spray a pizza pan with cooking spray. In a large skillet, brown the beef and onion. Drain. Add the Worcestershire. Add salt and pepper to taste. Set aside. In a separate skillet, cook the bacon until done. Let it cool and crumble it. Press the pizza dough into the pizza pan and prebake the crust for 8 minutes. While the crust is baking, prepare the sauce. In a small bowl, add the ketchup, mustard, mayonnaise and relish. Remove crust from the oven and spread the sauce on evenly. Sprinkle on half of the cheese. Sprinkle on the beef mixture and bacon. Top with remaining cheese. Bake for 6 to 10 minutes or until cheese has melted and crust is golden brown. Top with pickle slices if desired. Slice and serve. Recipe and photo courtesy of the-girl-who-ate-everything.com. 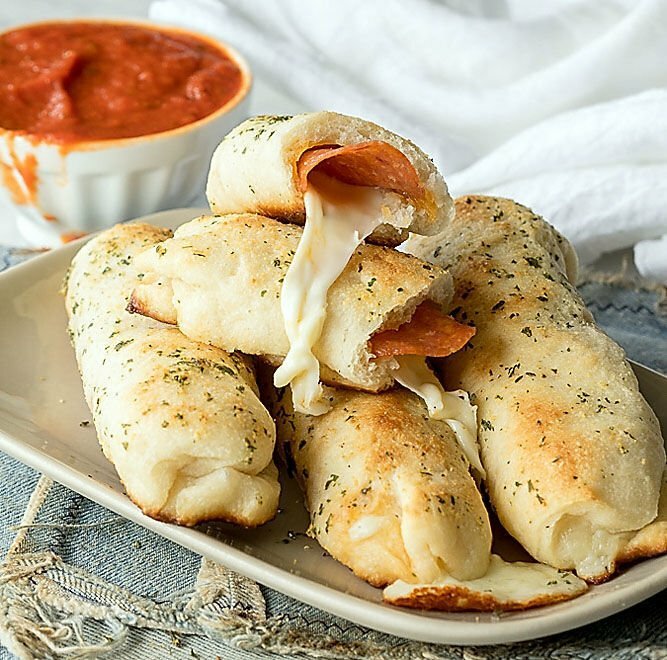 Bring pizza dough ball to room temperature on a floured pan. Cover dough ball with plastic and a dish towel and let sit in a warm place for 30 minutes. On a floured surface, flatten dough to a 12- to 14-inch round. Cover with plastic and dish towel again and let sit for another 30 minutes. While dough is sitting, mix pizza sauce with hot sauce. Preheat oven to 500 degrees with pizza stone. On a pizza peel, sprinkle cornmeal and place prepared dough circle on cornmeal. Spoon prepared pizza sauce onto dough, coming about a 1/2 inch from edge. Drizzle blue cheese dressing over sauce. In a small bowl, mix three cheeses and sprinkle over sauce. Spread pulled buffalo chicken over cheese. Slide onto the hot pizza stone and cook seven minutes. Check bottom of pizza and cook for one more minute if needed. Slide out onto a cutting board and drizzle some additional hot sauce over the top. Cut and serve. Recipe and photo courtesy of afamilyfeast.com. Bake at 350 degrees for 5 to 7 minutes, or until cheese is melted and slightly golden brown. Recipe courtesy of realfoodbydad.com. To prepare pizza dough, whisk together the flour, sugar, salt and yeast in a medium bowl. Add the warm water, and stir mixture with a wooden spoon until the dough just begins to come together. Place the dough on a floured surface and knead it for 3 minutes, or until it is smooth and slightly elastic. For the mushrooms, heat a very large (more surface area the better) skillet over very high heat. Add the olive oil, followed by the sliced mushrooms, spreading into a single layer with a wooden spoon. Continue to saute for 5 to 6 minutes. The mushrooms will quickly begin to release their moisture. Keep cooking until most of the liquid has evaporated. Season to taste with salt and pepper. Add the chopped garlic to the pan and continue to saute, stirring constantly, for 1 to 2 minutes. De-glaze the pan with the dry sherry. Place back on the heat, add the chopped rosemary and thyme, and continue to cook over medium-high heat until all of the sherry has evaporated. Set aside mushrooms to cool. Preheat the oven to 500 degrees. If using a baking or pizza stone, preheat it (alternatively, you can use a baking sheet) for at least 20 to 30 minutes. On a lightly floured surface, roll or stretch the dough until it forms a rough 10-inch circle. The dough will be thin. Transfer it to a pizza peel dusted with cornmeal (or the baking sheet, if using). Brush the top of the dough lightly with olive oil. Sprinkle the cheese evenly over the pizza, leaving a 3/4-inch border on the edges. Spoon the mushrooms and distribute them evenly on top of the cheese. Slide the pizza gently onto the baking stone (or place the baking sheet in the oven) and bake for 8 to 10 minutes. It will take slightly longer if you are using a baking sheet. Bake until the dough is golden and the cheese is melted and bubbly. Immediately drizzle the top of pizza with white truffle oil and garnish with additional rosemary sprigs or thyme leaves, if desired. Slice and serve. Recipe and photo courtesy of abeautifulplate.com. Preheat the oven to 375 degrees. Unroll the crescent roll dough and lay out on the ungreased cookie sheet. Pinch the perforations together to seal. Bake for 8 to 10 minutes or until light golden brown. Cool. In a small bowl, mix the softened cream cheese and sour cream. Use a whisk to remove any lumps. Spread over the cooled crust. Chill in the refrigerator. Brown the ground beef and drain. Add taco seasoning packet and water, according to package directions. Simmer for 5 minutes, stirring occasionally. Sprinkle the ground beef evenly over the cream cheese layer. Top with lettuce, tomatoes and cheese. Cut into serving-size pieces and serve immediately or refrigerate. Recipe and photo courtesy of livingwellmom.com. Preheat oven to 450 degrees. Spread pizza dough out on a lightly greased baking sheet. Cut the dough into 10 equal rectangles. Arrange 4 pepperoni slices on each rectangle and top with a mozzarella cheese stick. Roll up the pizza dough, enclosing the cheese stick, pinching the seams closed. Melt the butter and add the garlic powder and dried parsley. Brush the pizza sticks with the butter. Bake for 10 to 12 minutes or until golden brown. Enjoy warm with a side of marinara sauce for dipping if desired. Recipe and photo courtesy of iwashyoudry.com. Preheat oven to 400 degrees. Heat a skillet on the stove to medium-high heat. Cook riced frozen cauliflower until tender and the water is cooked off, about 6 to 8 minutes. Stir in Parmesan cheese and melt. Bake for 20 minutes. Remove from the oven and top with desired toppings like mozzarella cheese, pepperoni, etc. Bake for another 10 minutes or so until golden brown. Recipe and photo courtesy of hip2keto.com.